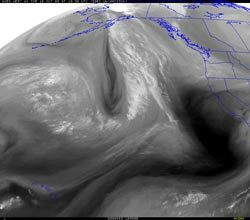 A potent early season Pacific storm carrying the remnants of West Pacific typhoon Melor has hammered California, setting numerous rainfall records, increasing stream flows, and producing heavy snow at the higher elevations of the Sierra. 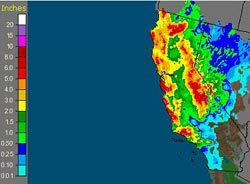 Several stations, including some in Southern California, recorded precipitation totals exceeding 10 inches. In Santa Barbara County, San Marcos Pass recorded 10.32 inches. In Ventura County Nordoff Ridge recorded 10.04 inches and White Ledge Peak 10.87 inches. Precipitation amounts in Los Angeles County generally ranged from 1 to 3 inches, with orographically favored foothill and mountain locations receiving the higher amounts. Little rain fell in Palmdale and Lancaster because of a pronounced rain shadow effect. Downtown Los Angeles (USC) received 2.03 inches. Here's an archived copy of a NWS Los Angeles/Oxnard Public Information Statement with some rainfall totals for the storm from around the area. A number of rainfall records for October 13 and 14 fell to the storm, including those for Paso Robles, Santa Maria, Santa Barbara Airport, WFO Oxnard, Burbank Airport, Pierce College in Woodland Hills, LAX, Santa Monica Pier, San Gabriel, and Long Beach Airport. Many of the records broken were set in 1957 and 1968 -- both El Niño years with above average rainfall at Los Angeles. Strong Pacific Storm Takes Aim at California. MEI Decreases, Some El Nino Signals Rebound. An unseasonably strong Pacific storm system, primed with the remnants of Typhoon Melor, and powered by an extended Pacific jet, is expected to pound California early next week with high winds, heavy rain, and heavy snow at the higher elevations of the Sierra. Medium range model forecasts suggest that the northern two-thirds of the state will see the highest rainfall totals, but over the last couple of days, the GFS has been trending wetter in Southern California. Significant rainfall in the Los Angeles area, and recently burned areas in the San Gabriel Mountains, appears to be a possibility. Forecast details should become more clear as we move closer to the event and into the forecast window of the high resolution models. The Aug-Sep Multivariate ENSO Index (MEI), decreased from 0.978 to 0.754, however other El Niño signals appear to be rebounding. In the last two weeks low level equatorial westerly anomalies have increased significantly. The reduction in the strength of the trade winds, and a downwelling Kelvin wave resulting from a very strong westerly wind burst already appear to be increasing upper ocean heat content in the central equatorial Pacific. The 30 day moving Southern Oscillation Index (SOI) is still positive, but is dropping, and should return to negative territory over the next week or so. The foci of recurring equatorial westerly wind bursts and enhanced west-central Pacific convection has been slowly migrating eastward. The most recent round of enhanced convection was centered at about 160E. This is consistent with a developing El Niño, and may have helped to extend the current Pacific jet following an East Asian mountain torque event. However, total and relative AAM remain negative, and are lower than is generally the case during a developing El Niño. Moderate El Niños come in many flavors and have varying impacts. Under the guise of such El Niños Los Angeles experienced its second wettest water year on record in 2004-2005, when 37.25 inches of rain was recorded; then in 2006-2007 had its driest water year on record, when only 3.21" was recorded.